SustainableWork: "Innovation Kitchen stirs economy with local produce & ready workers"
"Innovation Kitchen stirs economy with local produce & ready workers"
One of our premier regional publications celebrating agriculture and rural life is Agri-View, "The Number one Ag Newspaper in Wisconsin"
"At the Innovation Kitchen in Mineral Point, their cookbook is filled with signature recipes of family-crafted specialties. Among them is their own recipe for success, calling for a heaping tablespoon of leadership, a few cups of community support, and a dash of entrepreneurial spirit. And don’t forget the key ingredient: a few truck loads of Wisconsin grown produce." This is a well written story that accurately highlights many of the opportunities available through the Wisconsin Innovation Kitchen. I thought the article did a great job summarizing what's possible: "The Innovation Kitchen helps bridge the gap between locally-produced foods and the grocery store shelf, while also creating Wisconsin jobs. 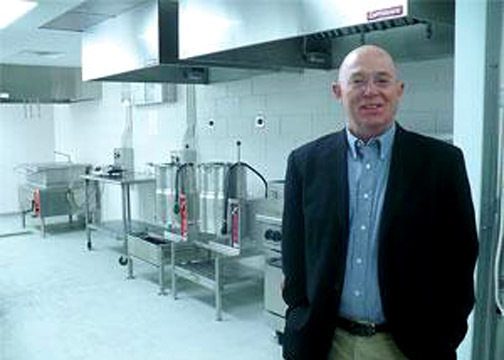 A hub for new entrepreneurs to grow their ideas, this commercial kitchen has a promising outlook." Agri-View article: "Innovation Kitchen stirs economy with local produce & ready workers"
Photo credit: Julie Martin and Agri-View.